Last winter, on the morning after a fresh snowfall of approximately ten inches, I made my way to the East Woods section of the Morton Arboretum, which I knew would be replete with image opportunities. 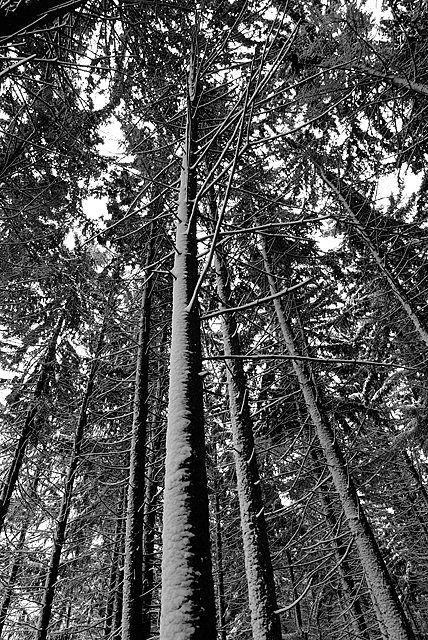 My favorite shot of the day was this image of a thick stand of mature spruce trees, which were well-coated with snow. The day was heavy overcast, and since the scene was virtually devoid of color, I converted the image to black and white, all the better to make the shapes and tones–which are the prime elements of the photograph–stand out. To see more of the Arboretum in winter, check this gallery on my Web site. 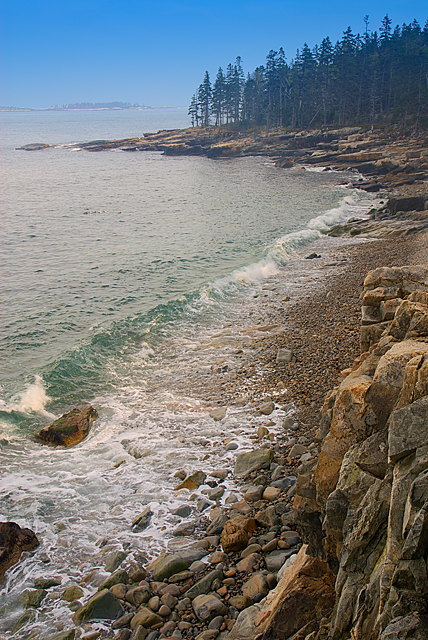 Captured in May, 2006 during a two-week long trip to Acadia National Park. The marine layer had an interesting effect on the light this day, substantially diffusing the late afternoon sun (which was to the right, given the orientation of this shooting position) despite the clear blue sky to the south. In addition to the singular light of the moment, I was intrigued by the shape of the cove and the intricate rocky face of the cliff that fell away from my perch. To see more from Acadia, please visit the gallery on my Web site. From my first trip to the Smokies, autumn 2004. Captured with an ultra wide angle lens angled slightly down to take in the fence and avoid inclusion of the cloudy sky, the image had some anticipated perspective distortion which was corrected in the digital darkroom. 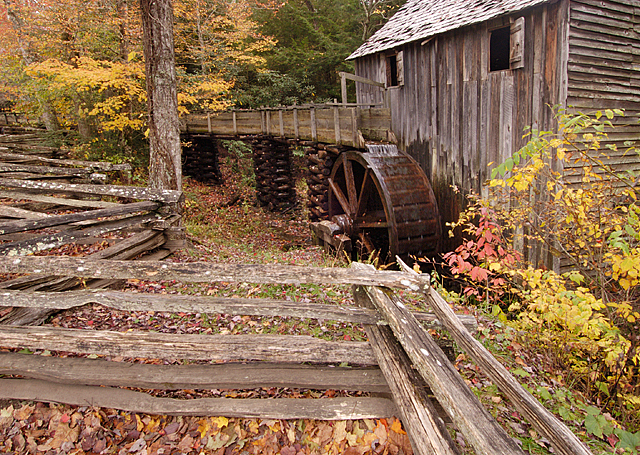 Contrary to the appearance of the shot, which depicts the mill in lonely isolation, this area of Cades Cove–adjacent to the visitor’s center–was a beehive of activity on this weekend afternoon at the peak of fall color in the park. To see more from the Smokies, please visit the gateway to my Great Smoky Mountains National Park galleries. Captured July, 2009, on the second to last evening of my two-week photo trip to the Pacific Northwest. The marine layer was an ever-present, teasing foil, sometimes producing frustration, sometimes creating immutable mood. In this instance, the capricious marine layer produced the conditions that created breathtaking, partially diffused light that bathed the shore in an orange glow that lasted less than a minute. Seconds after I snapped this shot the fog thickened, the glow was gone and the sun disappeared for good. To view more imagery from this trip, please check out the PNW galleries on my Web site. Very interesting blog and wonderful photos. So glad I stumbled upon your pages in my web travels. I was just in Maine this past July and I visited Acadia National Park and Bar Harbor! Your photo is lovely. It’s a beautiful place, isn’t it? Thanks; Acadia is beautiful indeed. I was last there nearly six years ago; I’d love to go back. For your photograph “Schoodic Peninsula, Acadia National Park, Maine” – the cove is so unique that it allows the eyes to follow it right out to sea. Maine has so many treasures to capture. Thanks for sharing. that’s what I’m talking about–words don’t come up to much when faced with work like this. phenomenal. 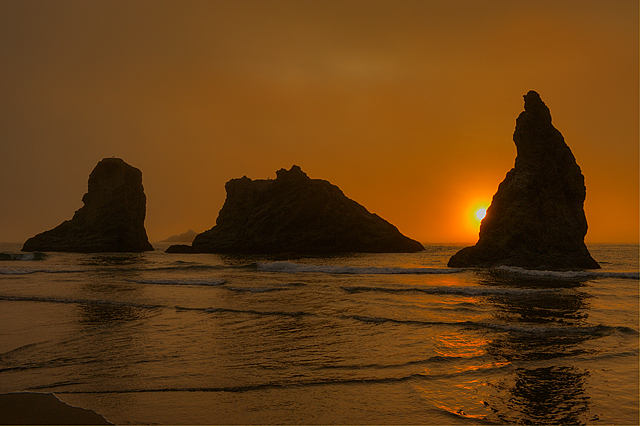 Love the sunset on Bandon Beach. Great shot. Shoodic Peninsula is great too but I’d like to see it with a longer exposure for some soft blur in the surf. Re the Schoodic shot, it’s to-MAY-to/to-MAH-to. I very deliberately did NOT go with a long exposure on that shot; for one thing, I wanted the breaking wave. For another, I think the mist-via-very-long-exposure-surf thing has been done to death. Different strokes, and all that; just my personal preference. Well deserved to be featured. I am a sunset sucker so I am most in love with the last photo. But, of course, all photos are undoubtedly spectacular. I like the variety of lines and textures in these photos. Thanks very much. You have some very, very nice work posted on your blog. Amazing pics.The world have so much beautiful places and you make with your photos like heaven. Thanks for taking the time to leave a comment–it’s much appreciated. Thanks very much…and, agreed, there is some breathtakingly beautiful scenery in Oregon.